Metal standards serve to promote understanding and communication between metal producers and users, including processors, fabricators and distributive traders, and thereby facilitate trading products of the metal industry. Standards are documented voluntary agreements that establish important criteria for products, services and processes. Standards help to make sure products and services are fit for their purpose and that they are comparable and compatible. EN (Euronorm), which is a harmonized system of European countries. Although it is accepted and has been effectively used in all European countries for nearly two decades, “obsolete” national systems, such as German DIN, British BS, French AFNOR and Italian UNI can still often be found in many documents. AISI (abbreviation from American Iron and Steel Institute), is traditionally used in the USA and abroad. Although it is obsolete, no longer maintained and is consequently being replaced by ASTM, SAE and other standards, it is still widespread. Japanese JIS standards, which are widely used in Asia and the Pacific area. JIS specifications have also often been used as a base for other national systems, such as Korean, Chinese, and Taiwanese. Besides official metal standards, many manufacturers and suppliers tend to use their own proprietary, commercial names for the designation of materials. After years and decades, some of these designations have become widely used within the industrial community, and they are often referred to as “common“ names or “trade” names, without actually referring to the particular supplier. In most cases, these “common” names are not standardized and properties may vary substantially; their application in official technical documents should therefore be avoided when possible. 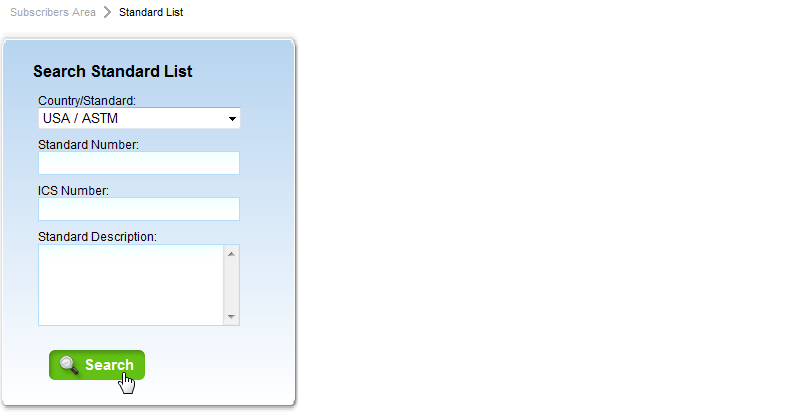 With Total Materia, finding information about a metal standard specification, its current status and the materials it defines is one click away. By simply selecting a Standard Development Organization (SDO) and/or typing the standard number, you receive immediate results from the multi-lingual database with over 52,000 standards. 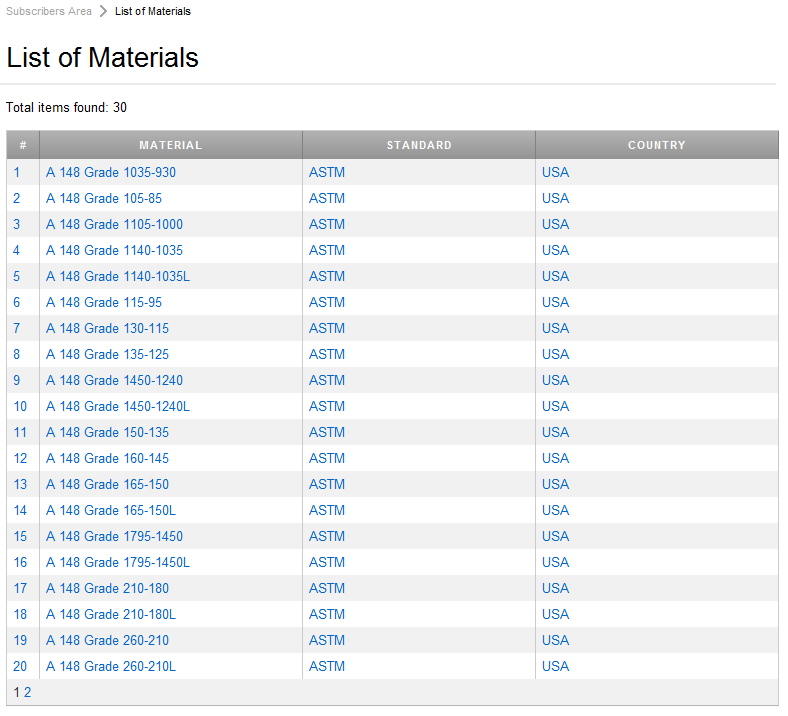 For example, you can review all metal standards from ASTM by selecting this SDO from the popup. 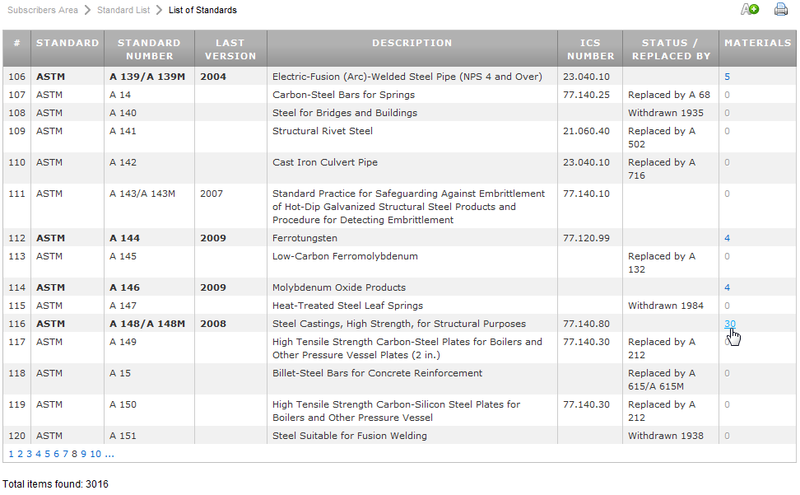 The result list consists of over 1800 ASTM metal standards. Information includes: standard description, year of last issue, current status (valid, replaced, etc.) and a hot link to the materials defined by this standard.